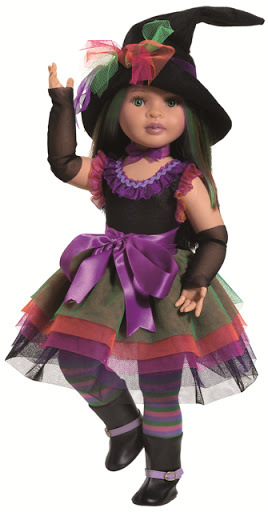 Fairies, Princesses, Skeletons, Witches, Unicorns…this year Halloween is magicial! 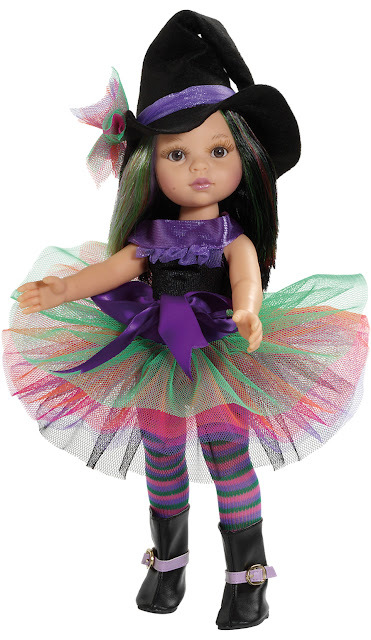 Halloween is less than two weeks away, and we’re thinking about how the dolls will dress for the occasion, and what kind of spells they might cast, and the tricks they might play! Our favourite costumes this year are pretty ones – fairies and princesses – of course they ride magical unicorns! Actually these pieces are pure reverie all year – so bear them in mind for Christmas gifts too, as children will create many stories with beautiful toys like these. Children love to use their imagination and Halloween is an occasion to be very vivid with fantasy and story-making. All children need is inspiration and a few beautiful and colourful props – just see how creative they can be! Perhaps these pink wands will cast good spells, what do you think??? I’m very sure you can make up your own stories, so I’d like to tell you about the toys you might like to consider having at your home to feature in the fantastic stories. 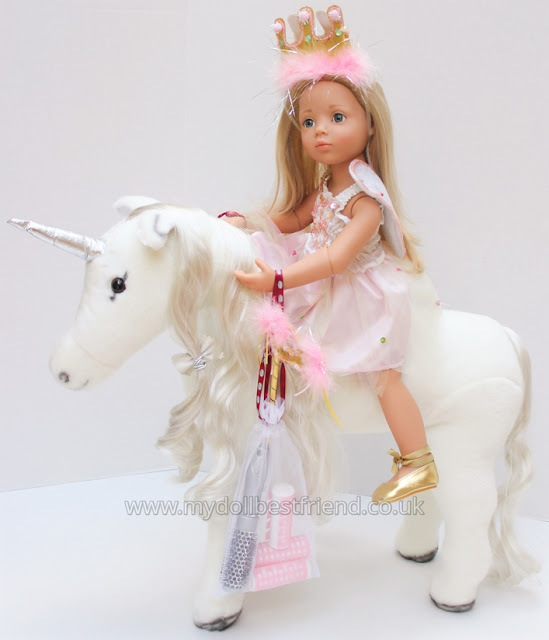 This is Happy Kidz Anna and she’s wearing the Gotz Princess set and riding the new Gotz unicorn which has real hair for mane and tail for braiding and styling. The unicorn she sits on comes with hair styling accessories that you can see above (she’s holding them!). 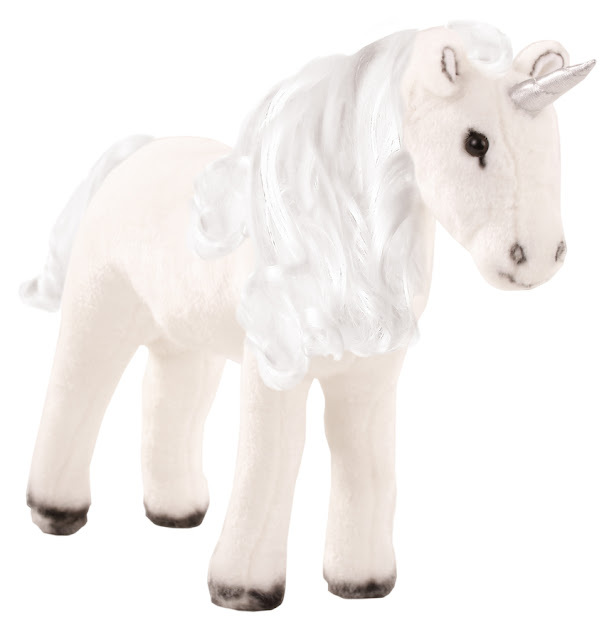 The unicorn is a plush toy but it’s lovely and sturdy, and like the dolls, is able to stand up. Now you can see her friend Clara wearing the Gotz Fairy Costume. Perhaps this wand casts good spells, what do you think? The unicorn is an adequate size to fit both Anna and Clara on the back so they ride away into a land of fantasy. No bridle is needed – the unicorn is magic! 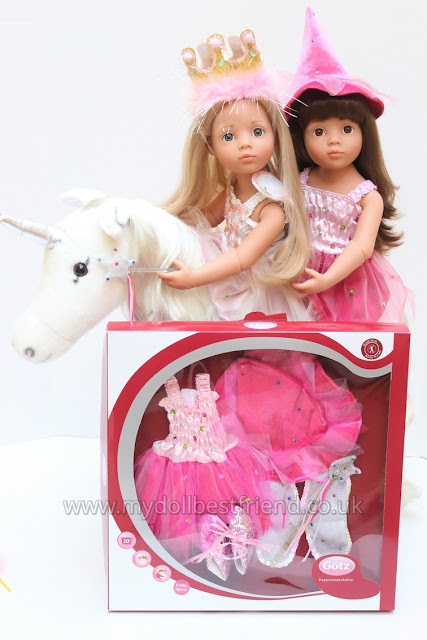 This is the Gotz Princess outfit and it’s £26.99. The Gotz Fairy Costume set is £24.99. Both sets come in these wonderful display boxes, making them great to give as gifts! You can see the Gotz unicorn above, and below you see it from the side and with the mane and tail brushing and curling accessories. The unicorn and hairbrush plus rollers is £44.99. With all of our Halloween accessories there is no limit to the possibilities for creative play. Good versus evil is a popular theme in play…. WHY NOT DECORATE YOUR WINDOWS FOR HALLOWEEN, WITH DOLLS? Passers-by will stop to look at the beauty and interest of your Halloween window display and children will point excitedly to the dolls. This year you could have Halloween decorations to be envied and admired! Neighbouring children will love to see your house decorated in the spirit of Halloween too! 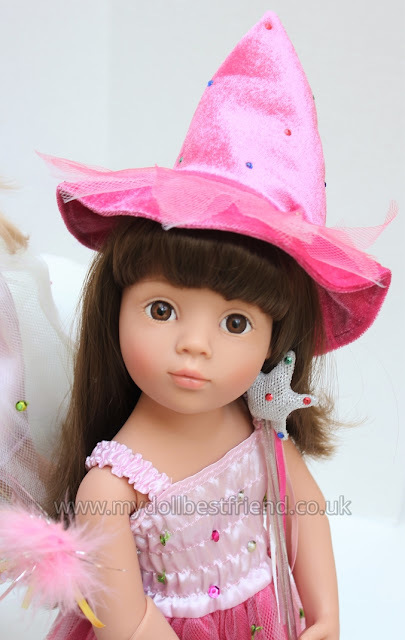 Paola Reina offers these two beautiful dolls, Abigail who is 32cm tall and Brujita who is 60cm and they both come wearing their Halloween costumes. Their face paint is richer than that of the other Paola Reina dolls and they have green, pink and purple streaked through their black hair. Join in with the fun this Halloween and decorate your window for 31st October. 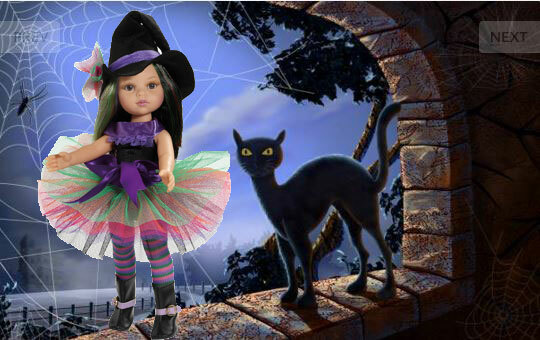 Best of all with these dolls you can enjoy your Halloween decorations all year round, just change the dolls’ clothes to something a little less dramatic! So, what will happen on All Hallows’ Eve in your neighbourhood? It’s just one night a year so get prepared in good time so that you enjoy every minute of your Halloween!